The Pe-8 is a Rank III Soviet heavy bomber with a battle rating of 4.3 (AB/RB) and 5.0 (SB). It was introduced in Update 1.53 "Firestorm". 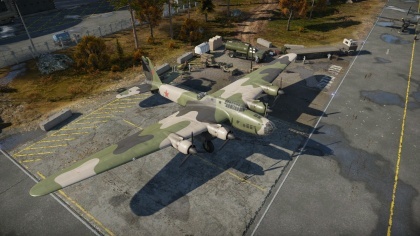 The Pe-8 (Petlyakov-8) is the first heavy bomber in the Soviet tree, known best for its incredible defensive armament and its ability to carry the FAB-5000 bomb, the largest bomb in the game. Weighing 5,000 kilograms, it gives the Pe-8 a payload rivaling many tier IV bombers, only outclassed at the same battle rating by the Halifax. Due to this, the Pe-8 has earned the reputation of being a Russian death star - It's very, very hard hitting, but, you will be targeted as a large heavy bomber. Enemies will make you a high priority target and will try to attack you at any cost, even if they lose their lives in the process. The Pe-8, as mentioned earlier, is basically a Russian Death Star (a.k.a Tu-4 at a lower tier). It both boasts a very effective cannon armament and a high bomb load, able to kill two bases in one pass. It's 5000 kilo bomb is especially useful in Ground Battles as a "tactical nuke" of sorts, able to wipe out large concentrations of enemy tanks. However, the FAB-5000's practicality ends there. 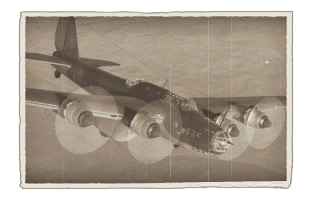 In Air Battles, the FAB-5000 is woefully overpowered against most targets and makes it inferior to most of the plane's other bomb combinations. In addition, it peculiarly does less damage against an airfield than the 4 x 1,000 kg payload, further decreasing its usefulness. Instead, use the other payloads. The stock payload of 40 x 100 kg bombs, while difficult to aim, can still be used to base bomb, simply drop 15 on a base to destroy it (remember that the first 16 are pylon mounted meaning they drop in pairs, so the first base will require only 8 presses of the bomb release button). Keep using this payload for base bombing until you unlock the 4 x 1,000 kg modification, as all the other payloads yield less damage. You can use your bombs to destroy ground targets as well, however, be sure to be high enough or use a timer so that the bomb's splash damage doesn't kill you. Try to side climb around the main battle when going after bases - though your defensive armament is powerful, you will be an easy target for experienced players, heavy fighters, and groups of fighters that encounter you. If you see an enemy, always turn the plane to make sure the rear cannon-armed guns face the pursuer so you can focus as much of your defensive firepower on them as possible while also increasing the time you can put your guns on the target. Make sure to fire in bursts as your guns will jam if fired for too long. When pursuing the Pe-8, try to go for a head-on - nearly all the time there is critical damage and "pilot snipes" to down the aircraft - with the added bonus that the front is the least defended area of the Pe-8. Use your mobility to do so. When in a not so optimal position, try to come up at a angle above the Pe-8 - with a sharp enough angle, you will stop the 12.7's from reaching you, and with a bit of luck, you will make it past the single 20 defending the plane. Frontal defensive ShKAS machine guns aren't particularly effective. While coverage to the rear is pretty good, frontal coverage is poor. Aircraft coming from high altitude can avoid the defensive fire power.